Often, people stop me on the street to ask, “Hey handsome writer, why should I get DivX Pro® Software?” And I say, “Um … what?” because it’s a pretty odd thing to randomly say to someone, even if you are a handsome writer. Then I realize that it’s just an imaginary conversation to introduce a blog post and all is well in the world. Regardless of whether anything I’ve said so far is true (not much), I can give an honest answer as to why you should buy DivX Pro® software. For starters, if you bought each DivX Pro feature individually, it would cost over $40 USD, but you can get DivX Pro for $19.99 USD. Simply drag MPEG-2 and VC-1 video files (e.g. unencrypted DVD and Blu-ray disc files) onto DivX Converter and covert your video to .avi/.divx, .mkv or .mp4 files. Get the amazing theater-quality sound of AC3 audio. With DivX Pro you can enjoy AC3 audio in DivX Software. DTS-HD Master Audio™ is a high definition audio format that delivers superior audio quality. 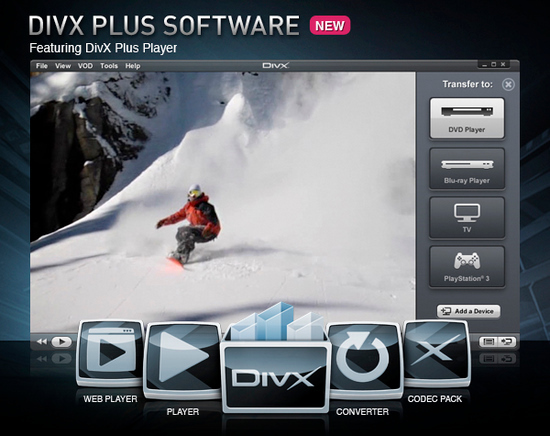 This DivX Pro plug-in allows you to play and convert video with DTS-HD audio. Ads make the tech world go round, but you can enjoy your videos in peace without third-party ads or offers in the software products or installer. Access your video from Google Drive and Dropbox to play in DivX Player or encode video with DivX Converter and save directly to cloud storage. Unlock the super high-tech (and geeky) features like custom encode settings like trimming, adding watermarks, adjusting frame rates, quanitzers and more. Plus, get HEVC 10bit playback and save video frame snapshots. Still not sure? Visit our site to learn more about the benefits of DivX Pro. Long-time DivXers may remember DivX Pro from several versions ago. Back then, DivX Pro unlocked output profiles in Converter and delivered advanced features in DivX Codec Pack. We decided to make output in Converter free back in DivX 8, and Codec Pack is no longer. But we’ve added several new premium audio and video components for DivX Software since then, and we’ve been working on new advanced features for Player and Converter. You may remember from recent updates the new Dolby Audio™ Edition and the evolution of MPEG-2 Plug-in to Video Pack in 10.3, and the new DTS-HD® Plug-in in 10.3.1. Now in 10.4, we’ve added video cropping and other custom encode settings in Converter, the ability to save snapshots and play HEVC 10-bit video in Player, and removal of advertisements in Player and Converter. All these new features and the optional components we already offer are now available in one easy package: the new DivX Pro. Everything that’s been free in DivX Software up to this point will continue to be free. Nothing changes for you if you’re using the free version of our Software. If you’ve bought, or want to buy, DFX Audio Enhancer, Dolby Audio Edition, DTS-HD Plug-in, or Video Pack, you can continue to do so. They continue to work and you can still buy them à la carte. If you’ve been thinking of buying more than one of the optional premium components, or love all the new Pro features we’ve added in 10.4, DivX Pro is a great opportunity to get everything: one purchase, one download, one serial number. And, we’ve priced it so you get a sweet discount. Who doesn’t love saving some $$, right? Making 4K video even better! DivX Pro isn’t the only exciting thing that’s new in 10.4: we’ve also added hardware accelerated decoding of HEVC video up to 4K in DivX Player. You may remember our post from earlier this year, ‘The Goods Under The Hood’, where we explained hardware acceleration and how we incorporate it into DivX Software to help make conversions faster and playback smoother, less resource-intensive. Prior to DivX 10.4, hardware acceleration was available for AVC (H.264, MKV/MP4) and ASP (MPEG-4, DivX/AVI) video. Now, HEVC (H.265, MKV/MP4) video can be played in DivX Player using the CPU on 4th, 5th, and 6th Generations of Intel® Core Processor families. This means that the experience of playing back 4K video up to 60fps, in particular, may be much improved. You may CPU usage or Memory usage drop, or finally be able to watch the video without frames dropping. For those of you interested in more details, we’ve shared preliminary test results of playing HEVC 4K video in DivX Player on a Skylake system over at DivX Labs. Or, learn more about DivX Accelerated, the integration of hardware acceleration capabilities in DivX Software. DivX Sale: Everything's 50% Off! Department stores are starting to sell Christmas decorations, which can only mean one thing: Halloween is right around the corner. There are several ways one can celebrate Halloween. You can carve pumpkins, wear crazy costumes, or beg your neighbors for candy (which APPARENTLY is socially unacceptable at my age…). Our friends at Film Fresh are celebrating the scary season by offering 20% off all movies through midnight on Halloween (Oct. 31). To get the deal, just use the coupon code FFHWEEN2010 during checkout.